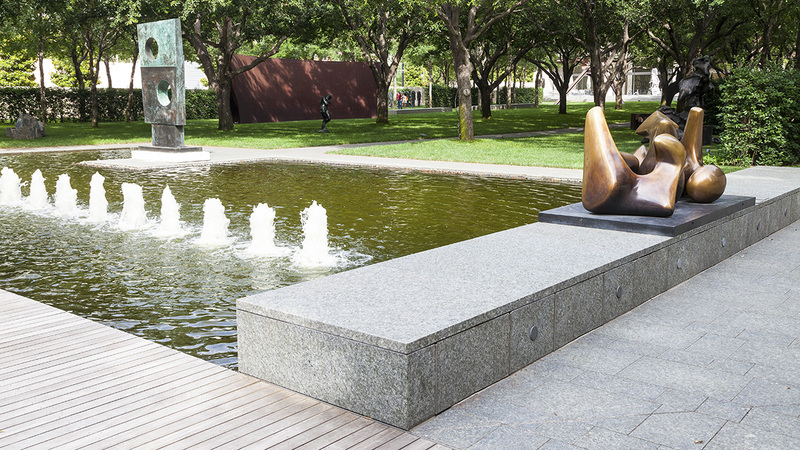 Designed by Peter Walker, this 1.5-acre sculpture garden is an integral part of the Nasher Sculpture Center, which covers a full city block in the city’s Arts District. 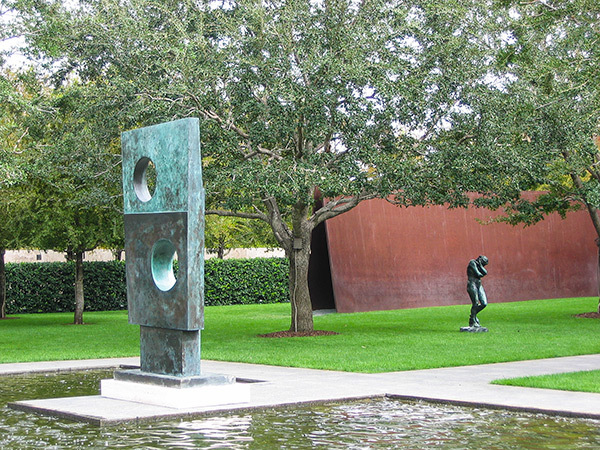 The center was built to house the collection of modern and contemporary sculpture belonging to real estate developer Raymond Nasher and his wife Patsy. 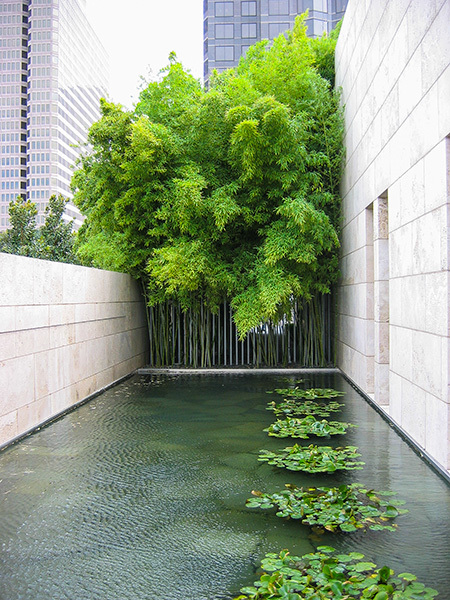 Architect Renzo Piano and landscape architect Peter Walker were both commissioned by Nasher in 1999. 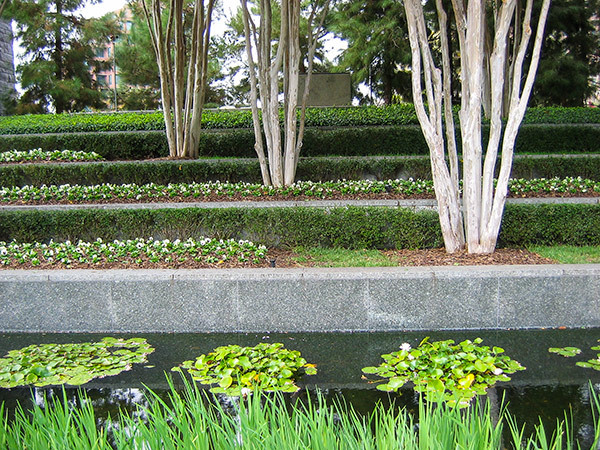 The garden is entered at the southeast from glass-enclosed, barrel-vaulted interior galleries. 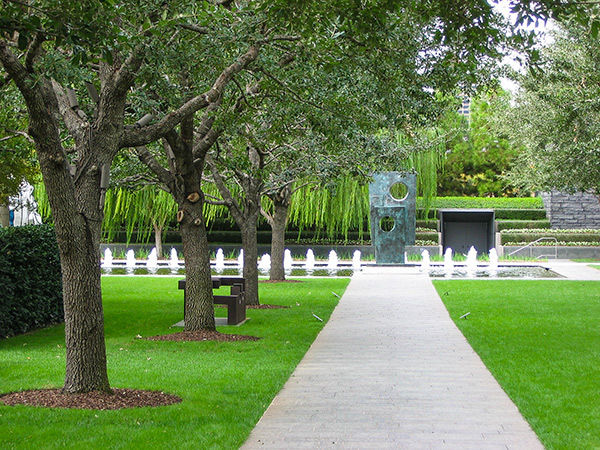 Four steps lead down from a wide apron to the gently sloping garden, which serves as a large open-air gallery surrounded by high walls of travertine block. 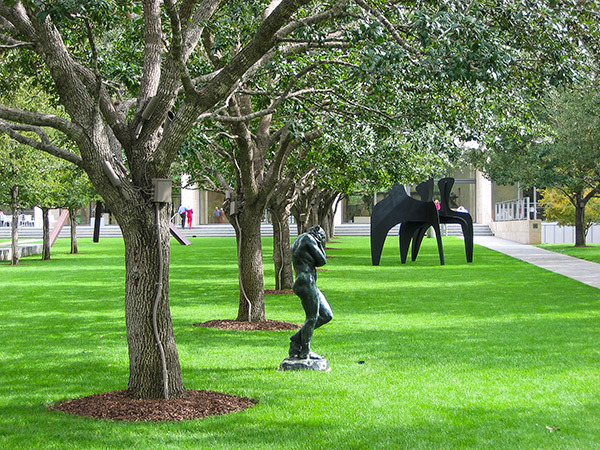 The verdant lawn at its center hosts a collection of permanent and rotating sculpture exhibitions. 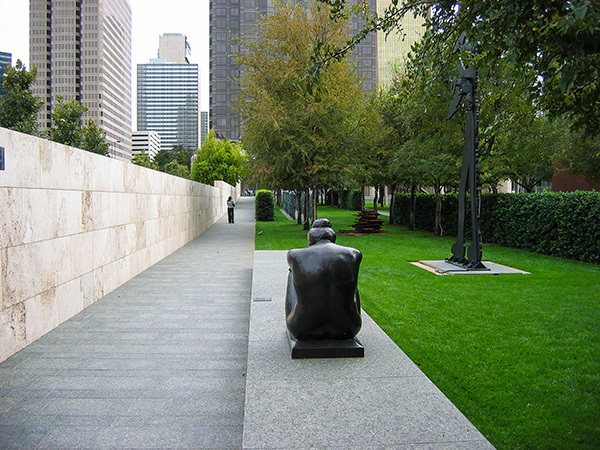 Parallel walkways partition the rectangular lawn, while plantings further divide the garden into outdoor rooms, and include more than one hundred trees of varying species—weeping willows, live oaks, crepe myrtles, magnolias, cedar elms, and others—that are set into the landscape in clusters and as allées. 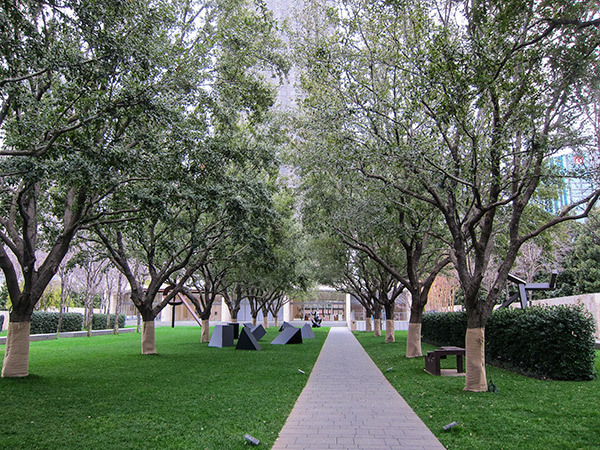 The rows of trees give formal structure to the design and are aligned with the walls of the internal galleries, further creating a seamless transition between indoor and outdoor space. 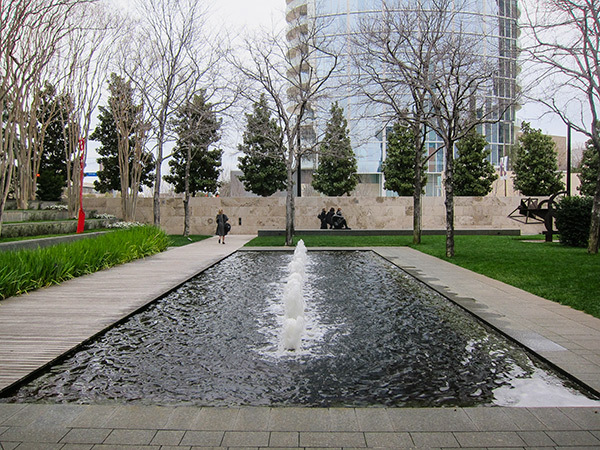 Noise from the surrounding streets is abated by fountains located on the sides of the garden, while rectangular pools with jetted fonts frame its northwestern end, which terminates in stepped terraces planted with trees. At the southwest corner, an outdoor theater descends to a lower-level auditorium. 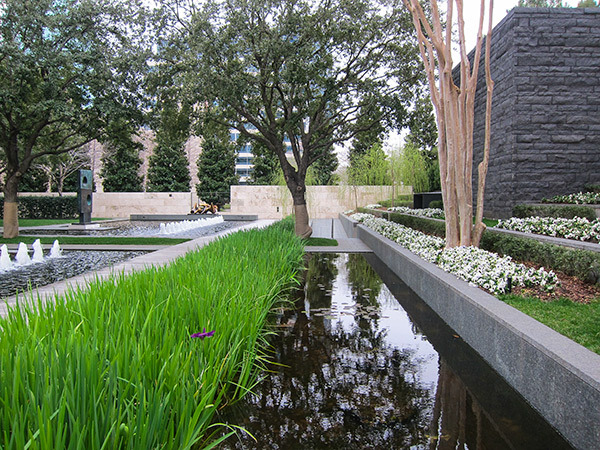 Opened in 2003, the sculpture garden won an Honor Award in Design from the American Society of Landscape Architects in 2004.